When I travel I take a lot of photographs. Which you might have already seen in this blog. Photos tell more than a than words, but I love the unison of both, words and photos. That is why I wanted to start a minisegment of my blog called #travelphotostories. It is easier for me to tell stories through the photos I have taken which is how this segment came to be. Today I decided to start with the trip that I have the most photos from, which is my time in Nepal. I thought telling stories behind the photographs would also open the country a little for you, my reader. 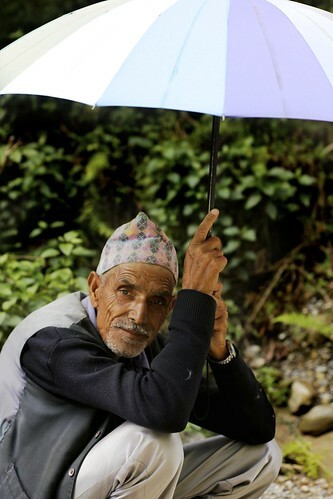 So here we go, travel stories through photographs, edition one: people of Nepal. I spent a lot of time with children in Lahachowk. That is also why a significant amout of my photographs are of children. The children in Nepal are happy, talkative and they smile and play. The ones who I had the pleasure knowing were also really hard working. The thing is, that children speak English better than their parents which is why I also learnt a lot of the country from children. 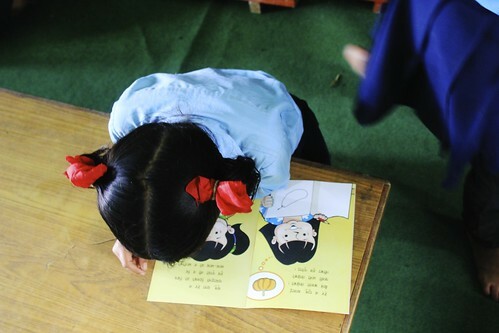 These children had just received a delivery of books to their school. I remembered what it was like in my school when someone told us to read. We hated it. These children did not. The school did not have a library, it was being built at the time I was there. The joy of opening boxes and picking books to read was addictive. For the next hour all the kids would read passages of the books to their teacher who would correct their grammar. I was on an assignment on the near by town of Lahachowk to film their new school building. When I was waiting for a class to end started this boy run around me playing with a toy they had just made seconds earlier. He would run back and forth with the toy and the parts in front would twirl in the wind. In the first weeks of my stay in Nepal I encountered this boy helping his mum do the laundry. The whole centre of Lahachowk is filled with rice fields and people walk around the irrigation channels between them. Families would also wash their clothes in the running water. These were my tourguides between Tihar and Dashain. There were not a lot of people to talk to in the village at the time. The older boys had gone back to school and adults to work but school kids were on a holiday. So each morning either I would walk up the hill to pick the children up or they would come get me. We would go on adventures around the village and they would tell me about the temple in the mountains, their mothers cooking and their day. They would buy a lollipop with their pocket money and be happy as ever. When I lived in Nepal I did not have a lot of adult contact. The adults work very hard, the men work in a nearby town and women maintain their farms. The people of Nepal are very hard working. I spent most of my time with women who did not speak English. The only conversations I had was with children, teenage boys and few fathers who lived in the city and returned to the town for the celebrations. Most of the time the village was filled with only mothers and elderly men. There was a walk path by the mountain that the town was in. At the bottom there were fields from which the women could gather hay for their animals. These women walked up those steps each day to feed their animals. I would encounter them everytime I walked down to the river to take photos. 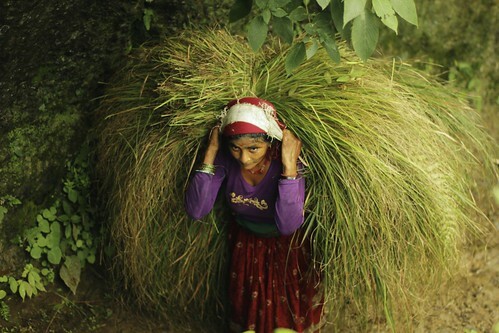 I once tried to carry the hay like this woman is carrying it and I can tell you, my neck would have snapped in half if I had to climb up anything with that amount of weight on my back. This is one of my favourite photographs from my time in Nepal. I met the man when I was walking around one day finding more material for my documentaries. He was herding his sheep and his umbrella made me smile. I walked up to him and smiled. Smiling was one of the main ways for me to communicate with the people as my Nepali was appaling. I signalled towards my camera and he smiled and nodded and posed himself. He then took a stern look and looked straight towards the lens. There is just something about him that makes me still feel gratitude that I was allowed to capture this photo. In contrast this is one of the most emotional shots I have taken. I was sitting on the bench outside the house editing when this old lady came and laid down and fell asleep by me. I asked my host mum what was wrong and she explained that the lady’s son had married a woman who did not like her to be in the house. She was allowed to sleep there but otherwise the wife chased her away so she often came to sleep on the porch of the neighbours. When I met my host brothers later that year I asked if this was common and they told me that there is some internal struggles when it comes to the elderly of Nepal. People want to care for them but sometimes marriage tears the families apart. And the last photo is of me. I dislike being in front of photographs or at least when I am being photographed. Which is why you see so many photos of others. This was from a day when my host mum insisted on me wearing all her different sharis. I stood in front of the house whilst my host mum and another lady poked into the loose flesh of my stomach telling me that I was big. But I just giggled. The situation was just so funny. I tried on about 10 different combinations until my host mum settled in this one that she liked the most. Then she made me pose in different places whilst she became her own Annie Leibowitz. This photo makes me smile as it is one of the only photos of me in Nepal. A week later I packed my bags and left back to Europe and here I am still. Hopefully one day I will go back and see if the house is still there.